By 6 PM last night, the plenaries of Brazil’s house and senate were empty. A long-promised political holocaust had arrived. Supreme Court Justice Edson Fachin had just authorized corruption investigations into nearly a third of interim president Temer’s cabinet, and a similar proportion of senators. The list to be investigated totals 108 leading politicians. For a sense of scale, note that this only includes those who benefit from privileged jurisdiction, and so can only be investigated by the Supreme Court. President Temer himself is also cited but wields temporary immunity. Brazil’s three former presidents are also included, as are nine sitting state governors, who will be investigated by lower courts. This is the latest act in the titanic anticorruption investigation known as Lava Jato (“Car Wash”) threatening to explode Brazil’s political establishment. More revelations are still to come. The Lava Jato operation began when Sergio Moro, a little-known judge in a southern state capital, began to uncover bribery, kickbacks, illicit funding of parties, and plunder of public assets at an immense scale, all centered on the oil giant Petrobras and its contractors, mainly in the construction industry. The sums alleged to have been plundered total in the tens of bllions of dollars. It remains a misconception outside Brazil, however, that Lava Jato caused the impeachment of President Dilma Rousseff of the Workers’ Party (PT). She was impeached on the frivolous grounds of breaking budgetary laws. No evidence has yet been produced to tie her to the corruption scandal. Michel Temer, Rousseff’s former vice president, is now president. His Brazilian Democratic Movement Party (PMDB) is an ideologically amorphous party that serves as little more than a vehicle for power, and as the (small-c) conservative ballast in Brazil’s establishment. His party now rules in a de facto coalition with the neoliberal Brazilian Social Democracy Party (PSDB). Last year, leaked recordings involving Temer allies laid bare the real motives to impeach Rousseff: her unwillingness to protect leading politicians from investigation. Meanwhile, having lost the presidency, the PT hopes that former standard-bearer Lula can stage a comeback in the 2018 presidential elections — a probable outcome, according to most recent polls. Yet Lula remains squarely in the sights of Lava Jato. He is Moro’s trophy beast. Should he be charged and found guilty, he cannot run. A provincial judge has been turned into Brazil’s kingmaker. One could argue he is the most powerful man in the country today. Yet despite last night’s bombshell, the goals and political character of Lava Jato remain undefined. Is it a partisan project, as many PT backers claim? Does it aim to be a limited initiative which stops after ensnaring its primary targets, or is it a thoroughgoing anticorruption crusade, capable of eviscerating the entire political class? Up until late 2016, the major figures ensnared in investigations were from the PT. In March of that year, Brazil’s left-wing former president Lula was sensationally detained by federal police, without charge. Additionally, media cheerleading of Lava Jato and orchestration of anticorruption protests had all targeted the Left. Judge Moro encouraged this with deliberate PR moves, such as the (illegal) leaking of (illegally obtained) recordings of Lula and then-president Rousseff. This raised hackles for privileging spectacle over due process, and surfaced preexisting doubts about the neutrality of the judiciary. Brazilians are used to seeing political corruption punished with a mere slap on the wrist, so the judiciary’s newfound zeal — while potentially welcome — seemed mainly to apply when prosecuting Workers’ Party figures. Indeed, even the Rio de Janeiro state branch of the Order of Brazilian Lawyers criticized Moro for his selective leaking. His puzzling and self-serving defense was that these were not leaks, but deliberate publications. Lula was then accused of being the mastermind of the whole Petrobras-related corruption scheme without any evidence. Then last month, blogger Eduardo Guimarães, who had pre-emptively revealed Lula’s arrest, was detained and questioned, in order to coerce him into revealing his source. The secrecy of sources is protected by Brazil’s constitution; and as we’ve seen, Moro, as Lava Jato’s leading judge and the author of Guimarães’s detention, has been promiscuous in his own use of leaks for PR purposes. These events furthered the theory — held by impeached President Dilma Rousseff, among others — that Brazil is living in a state of exception. However bad this partiality might seem, it is not self-evident that the alternative — the taking-down of the bulk of the political class — would be preferable. Now Temer has nine minsters under investigation. The Right’s defeated 2014 presidential candidate, Aécio Neves of the PSDB, is the most-cited politician in Justice Fachin’s list. The PSDB’s expected 2018 presidential hopeful, São Paulo state governor Geraldo Alckmin, is also to be investigated. More broadly, around 60 percent of both houses of Congress are under investigation for serious crimes, some of which fall under Lava Jato. A situation in which all leading politicians fall under the judge’s hammer might set a new precedent in Brazil and end elite impunity, as its supporters claim. But as I discuss later, it won’t “end corruption,” it will only transform it. And worse, it would likely lead to a political vacuum similar to what Italy experienced in 1994. This paved the way for Silvio Berlusconi’s long rule. One fears that Brazil will end up with even worse. The Italian corruption scandal of the early 1990s, known as Tangentopoli, and the consequent wide-ranging “Mani Pulite” (“Clean Hands”) investigations, are hugely instructive for understanding the politics of corruption in Brazil today. Indeed, Moro himself, who began planning Lava Jato roughly a decade ago, has professed to modeling his investigation on Mani Pulite. Italy in the early 1990s, much like Brazil today, was engulfed in a crisis by no means reducible to the corruption scandal. The overarching international context of early-nineties Italy was the end of the Cold War and thus the end of anticommunism as a cohering strategy among the bourgeois parties — something not present in Brazil today. But there are other factors that parallel today’s Brazil. As Paul Ginsborg explains in his excellent history of eighties and nineties Italy, the country, rocked by the 1992 recession, took desperate measures to meet the Maastricht criteria for the European monetary union. Thus commenced a period of deregulation, privatization, and a drive to cut the fiscal deficit and public debt. The background to this process was an inefficient state; degraded party government; and widespread corruption and elite impunity. It was in this context that a new social actor was born: a minority within the state, concentrated in the judiciary, whose zeal for efficiency and the rule of law dovetailed with popular anger at corruption. Enough of this should sound familiar to Brazilian ears. Needless to say, today there is no communist threat, nor the aftermath of its defeat (as I explained here, if Rousseff’s impeachment was a coup, it was not to depose a “left-wing regime”). But in the opening of the economy there is a contextual similarity. In Italy, regional integration into the European Community drove reforms, while in Brazil there is a confluence of a neoliberal “transparency” agenda with international financial interests. Brazil’s recession, a decrepit state, popular anger, and the new crusading judiciary is a mirror image of early-nineties Italy. A festive air pervaded many parts of Italy, as always happens when the habitual ordering of a society is suddenly brought into question. But as in Italy, so in Brazil: behind the celebration were divergent motivations, reflecting differences of class and culture. For your average worker, seeing businessmen and politicians led away in handcuffs might look like the end of upper-class impunity and — finally! — the impartial application of the laws of the land. For the small businessman, it might signal the end of the use of political influence for private gain — denied to him, but available to the big businessman. For the big bourgeois, it represents the downfall of an inconvenient political party. But not everyone was celebrating, because the investigations appeared to be targeting the center-left — in power for a decade, though for the first time since the 1964 coup. On the one hand, the Italian magistrates always kept a scrupulous respect for the criminal proceedings and, at most, did nothing but apply rules that had been strategically ignored by a judicial system that was not only conformist but also complicit with the privileges of the ruling political elites in Italy’s postwar politics. On the other hand, they sought to apply the same unvarying zeal in investigating the crimes committed by the leaders of the various governing political parties. They assumed a politically neutral position precisely to defend the judicial system from the attacks it would surely be subjected to by those targeted by their investigations and prosecutions. This is the very antithesis of the sad spectacle currently offered to the world by a sector of the Brazilian judicial system. Moro may have modeled his investigation on Mani Pulite, but he failed to project the neutrality of the Italian example. To legitimize the investigations, he enlisted the oligarchic media, creating a media spectacle in which the PT was at the center of most leaks, insinuations, and allegations, while the elite’s favored representatives were treated with kid gloves. If one connects Lava Jato’s politicization to the other factors which led to Rousseff’s ouster, it looks awfully conspiratorial. President Temer was after all caught on camera stating that Rousseff was deposed because she failed to adopt the PMDB’s neoliberal “Bridge to the Future” plan. His barely legitimate government, which lost six ministers in its first six months, has since passed a constitutional amendment, PEC 55, which freezes public spending for twenty years. Drastic reforms to pensions, the legalization of “unlimited” outsourcing, and the sell-off of state assets have followed. Temer’s scandal-plagued government is accepted by the elite, faute de mieux. The right-wing movements who called for Rousseff’s ouster as part of a drive to end corruption are highly reticent to criticize Temer. Was all the anticorruption talk pure hypocrisy? First, we need to realize it is impossible to end corruption. Even the cleanest political systems in the world are corrupt, and often appear so because their corruption is legalized. The concept of corruption in the modern world is premised on the separation of public and private interests. While private interests in market society are normal and in fact constitutive of that society, the intrusion of private interests into the public realm of state and government is held to be pathological. That is the modern definition of political corruption. But in reality, it is impossible to create and protect a disinterested public realm, driven purely by republican virtue. Many of the business interests who cheered Lava Jato wouldn’t tolerate such a thing and would shrilly denounce any attempts to limit lobbying. So what were the anticorruption zealots really hoping for? Here we need to understand that the liberal concept of corruption has been superseded by the neoliberal idea of transparency, led by the work of Transparency International and the international financial institutions. It signifies, instead, predictability, lower transaction costs for capital, and the elimination of all informality in regulation and rules. Transparency is hence not the protection of the public realm from private interests but the protection of specific private interests (especially international capital) from rent-seeking by public servants or other unpredictability related to clientelistic networks. While one wouldn’t want to defend clientelism, it should be clear that “transparency” is intimately associated with the political-economic priority that states be open to international capital. Hence Attorney General Rodrigo Janot’s speech at Davos in January 2017 describing Lava Jato as “pro-market.” (He later claimed to Brazilian press that the elite audience was enthused by his presentation.) Lava Jato is supposed to improve the investment environment in Brazil, and “avoid crony capitalism, cartelization, ensure competition, economic efficiency, and technological development.” The Davos speech exposes what Lava Jato is about: not a neutral application of the law to the previously immune, but a political-media-judicial campaign, tightly imbricated with the attempt to advance neoliberal forms of management in Brazil. Those pushing for Lava Jato to usher in a Brazil freed from corruption actually desire a Brazil in which international capital is free. Will the case result in a substantial long-term improvement in Brazilian justice and institutions, as its supporters hope? Or will it fizzle out like the “Clean Hands” investigation in Italy of the 1990s, which resulted in more than a thousand arrests but little decline in systemic corruption over time? In October 2016, the architect of Rousseff’s impeachment, the widely reviled and recently deposed president of the lower house of Congress, Eduardo Cunha, was arrested. This was followed by the November arrest of Sérgio Cabral, the former governor of Rio de Janeiro state. Cunha has now been sentenced to fifteen years in prison, while Cabral is due to be interrogated by Moro personally later this month. Both are from Temer’s PMDB. Yesterday’s announcement, based on Attorney General Janot’s list of politicians, all emanate from the plea bargains of executives at the construction company at the center of the scandal, Oderbrecht. Unlike the early phases of the investigations, it features figures from across the political spectrum, including leading PMDB and PSDB members. While this did not stop big media outlets from focusing on allegations against former president Lula’s involvement at the expense of others, it seems the investigation itself is ecumenical. There are people with power over the investigation that, in the guise of punishing any and every act of corruption, desire to invert the most elementary judicial logic, putting at risk the whole operation, and thereby consecrating in Brazil an authoritarian Justice that is proper to tyrannies. It is worth thinking through exactly what the Estado de São Paulo attack means. The paper whipped up an anticorruption frenzy while Rousseff was in power, only now to turn around and wring its hands about rights being infringed, complain that things have gone too far, and call the whole affair “neoinquisitorial.” The paper’s backlash is first and foremost an expression of the corporate press’s conservative politics. But it also tells us something about the structural limits placed on a public judicial investigation. Will the bourgeoisie sit by as the state cannibalizes all its representatives? Once you start to play the political game, once you step on that field, a kind of countdown clock starts to go tick tick tick. Because by moving beyond pure jurisprudence, and including public relations in your focus, you become vulnerable to the inevitable ebbs and flows of public opinion. In their desperation, the talk is that Congress will try to pass an amnesty bill — something they tried and failed to do last year — shielding politicians from further prosecution. Suspicions abound that some deal will be sewn up between leading justices and politicians, as Temer regularly lunches with the president of the Supreme Electoral Tribunal. This all speaks to a broader political crisis in which sections of the judiciary, the legislature, and the executive are at odds with one another. There is open conflict within the political class. One tendency is represented by the anticorruption zealots, the section of the judiciary allied to Moro, who wish to see Lava Jato through to the end, and would see enacted in Brazil a sort of judicial dictatorship. The other side is the old elite who feel the investigations have gone far enough and are in panic about the political holocaust to come; for them, order must be restored. In this, the majority of Brazilians are spectators. Much as we might wish to see justice done and the guilty go down, thoughts of the consequent vacuum are unsettling. Defending corrupt and reactionary representatives is unpalatable, but rule by judges would surely be even less democratic. However, the elite remain united in their support for Temer’s neoliberal reforms; and the masses certainly have skin in that game. 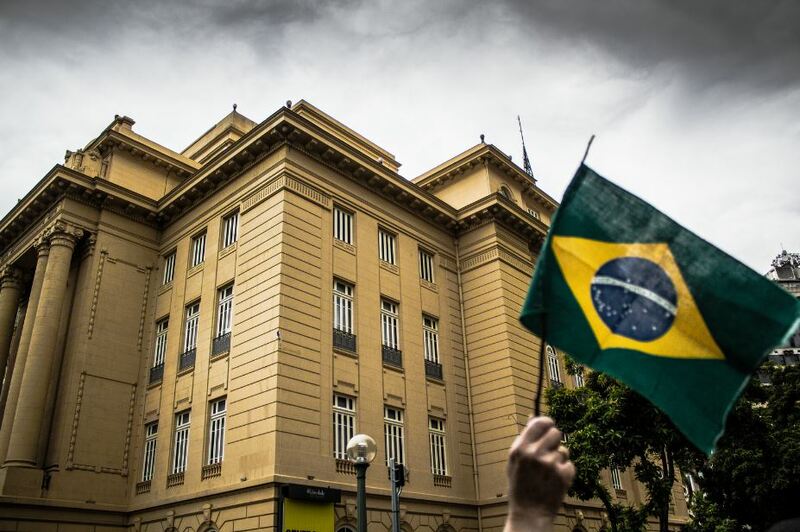 The #15M protest last month saw the first significant popular mobilization against the interim government’s neoliberal reforms, with a million Brazilians on the street across the country, as well as widespread strikes. São Paulo, the largest city on the continent, has in recent years become the fulcrum of popular mobilization. Site of the explosive June 2013 protests and host to the biggest pro-impeachment demonstrations, in March the city saw nearly two hundred thousand on the streets against a fresh round of pension reforms. This follows a long period of quiescence. As further evidence of conspiracy emerged, and the Temer government swung from scandal to scandal, much of the Left asked the middle class, “Where are your pots and pans now?” — a reference to the infantile anti-Rousseff protests in which the middle and upper classes would beat their kitchenware during the nightly news. For many on the Left, those sections of Brazil’s new middle class who took to the streets “against corruption” were the useful idiots of the crisis, decrying the PT and corruption, only to end up with far worse. The anticorruption protest movements meanwhile — whose base is the professional upper-middle class — now find few takers for their demonstrations. As of yet, though, the PT-dominated left has failed to provide a convincing alternative. Modernizing reform and rationalization of the state, in the service of development, is needed. But it must not be carried out on the backs of the majority of Brazilians. Lula might lead in the polls, but the judge’s gavel swings over his head. Further, the delusion of thinking Lula might bring back the good old days of the 2000s should to be resisted. The political-economic conjuncture which made Lulismo possible is long gone. So is the moment in which Brazil’s elite accepted moderate social democracy. It was tolerated through the previous decade because, however much the position of the poor improved, that of the rich improved many times over. There is little point now in the class conciliation that won the PT the presidency back in 2002. Unfortunately, the political victim of the corruption controversy is not just the PT but politics itself. Anti-politics is the predominant force, with scant trust in politicians of any hue, and no popular consensus on a political program going forward. In October 2016’s municipal elections, nul/blank votes came in second in four of the country’s five largest cities. In several metropolitan municipalities of a million-odd inhabitants, the combined abstention/null/blank votes came in first. It was also a unity of old and new: traditional clientelism, but allied to a sense of modern entrepreneurialism, unconcerned with the fustiness of the public sector and comfortable old arrangements. For all the screeching about fascism today, the model of the contemporary anti-political opportunist is not Mussolini, but Berlusconi. In Brazil we are witnessing something similar. São Paulo, the place with the most “modern” politics in the country, has a new mayor in wealthy businessman and TV star João Dória Jr — a man who has made every effort to present himself as a non-politician, but who has cultivated close relations with the PSDB for a long time and was rightly described by the Intercept as “unscrupulous, superficial, and sly.” Sound familiar? Many are now tapping Doria to run for president in 2018. Even less appealing savior figures wait in the wings. Jair Bolsonaro, possibly one of the most reactionary elected representatives anywhere, continues to poll disconcertingly well. Whether the political class is able to stitch up an accord to save itself or it instead falls to Moro’s crusade, neither will change the anti-political mood. In either case it will likely be exacerbated. It is a volatile situation in which sources of leadership are few and far between. International forces are unlikely to help; the powers of the Global North are also unravelling, buffeted by the winds of anti-politics. Only leadership by a grassroots left can salvage the situation. The fear is that instead, authoritarian opportunists will be the ultimate beneficiaries of today’s political conjuncture. Brazil’s massive corruption scandals have turned the country’s politics into a spectator sport.